4.1 / 5 Score from 9 reviews. - 10% discount until 30 Sep 2019; - 5 % discount until 31 Oct 2019; - 3% discount until 30 Nov 2019!! 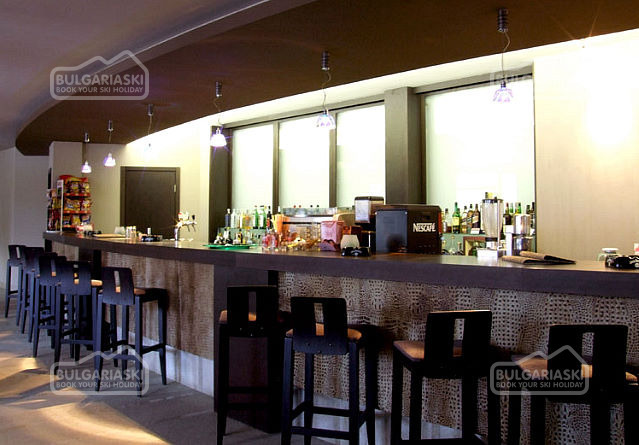 Location: Park Hotel Gardenia is situated close to the centre of Bansko ski resort, next to the park with pine trees, lawns, bikers paths and artificial lake. Accommodation: Park Hotel Gardenia offers 89 rooms – single rooms, double rooms, double luxury rooms and a Presidential apartment. The rooms feature air-conditioning, Wi-Fi Internet, mini-bar, telephone, safe deposit box, balcony with mountain or park view. In the standard rooms the bathrooms feature bath-tub, telephone, hair-dryer and panic button. In the luxury rooms and the presidential apartment there us a jacuzzi. Wine & Dine: The two-storeyed Mehana (tavern in traditional Bulgarian style) offers local specialties and meals from the Bulgarian and European cuisine. 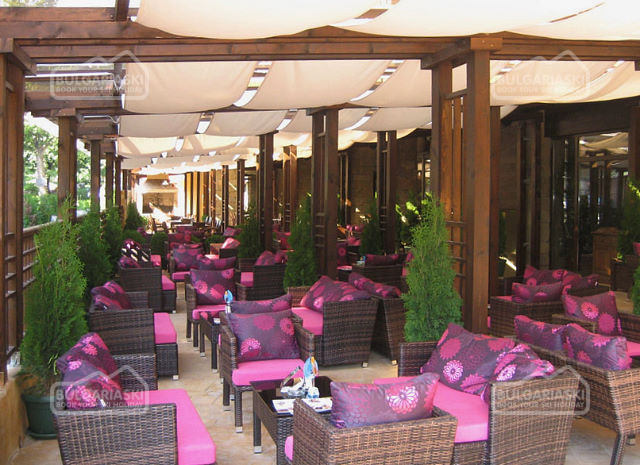 The Italian restaurant for 110 seats and a summer garden for 120 seats serves International cuisine. Its working hours are from 12.00 pm to 12.00 am. 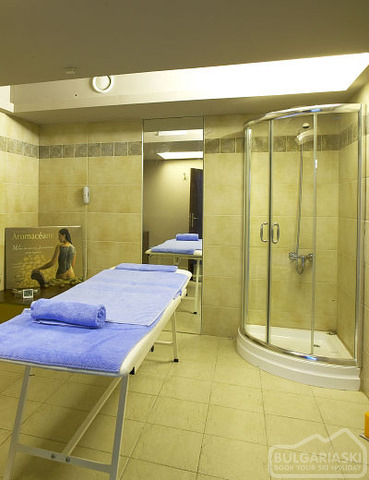 Spa & Wellness centre: The Spa centre offers a variety of massages and spa and wellness procedures, indoor swimming pool, steam bath, fitness hall, jacuzzi, sauna, solarium. 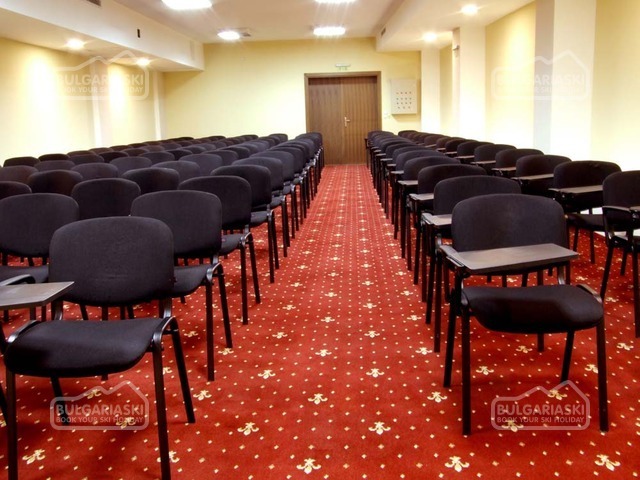 Conference facilities: A conference hall for up to 120 persons is fully equipped with such facilities as project screen, Wi-Fi Internet, sound system. It is the perfect place for your conference or business event. For kids: The Kids Club offer professional baby-sitters for your children from 08 a.m till 6 p.m. At your disposal is a baby-sitter for children under 36 months. Just had dinner there this evening, on-the-spur, we got there early 7pm and the buffet for the residents looked stunning. Lovely decor and furnishings in the restaurant, abit used, but clean. We ordered from the menu and got EVERYTHING we asked for....unusual for Bulgaria. The food was absolutely gorgeous and we loved the Wilbert Longmire and other wide mixtures of jazz for ambiance. We will recommend it to anyone. The prices were very reasonable too, all in all, a lovely evening, thank you guys. i stayed there feb 16/23 2013. The rooms were very good and comfortable and maids visited daily. 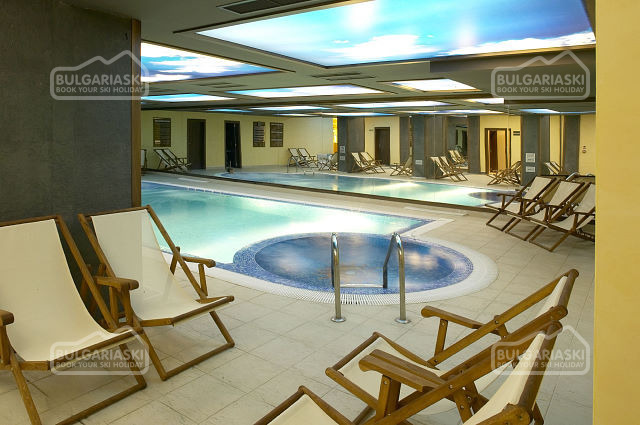 The pool spa and steamroom along with the sauna were very good as they were all included in the price of the holiday. The breakfast was adequete bacon eggs and sausage(hot dog) along with cereals . evening meals were set out for the russians and bulgarians, but we did enjoy them all the same fish chicken lamb etc. The ski hire centre did not have skis for my twin girls so we had to hire from town so made things a bit akward each morning getting ready to hit the slopes. But all in all we had a very nice stay out of the main area and would deffinatley return to this hotel if we go back to bansko. I spent 7 days in the hotel. The room was very nice with a very big and comfortable bed. The food was ok, the restaurant was nice with one minus for the witers cause they do not speake english. One thing to be improuved are the TV chanels witch are too many russsians and bulgarians, only one was english. I also belive that the instructions for using of swiming pool, sauna should be written also in russian, as i notice they do not speak, read at all english, and as a consequence they are disturbing the guests of the hotel with their impolite and very rude habits.Hope that i will come back to basko because they have a lot of slops for snowboarding ! I stayed at the Park Hotel in April 2007, and found it to be very comfortable, the room was large and airy, very well presented, the staff were extremely helpful, and i am going back in December, the best thing about the Park is its location down in the town, but bus available to take you to the ski slopes when required. If you stay there you must try the restaurant, the food was great and very good value. Please, post a comment on Park Hotel Gardenia. * The rates are in EUR per room/apartment per night with breakfast included. 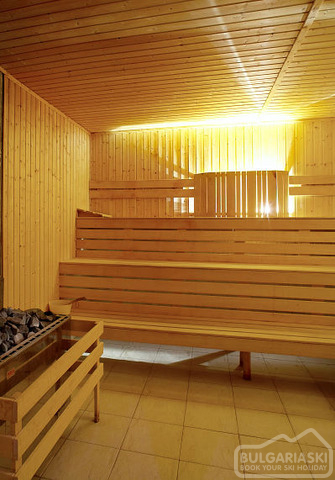 The rates also include Internet, indoor swimming pool, steam bath, sauna, fitness, sauna, jacuzzi, ski wardrobe and transport to the Gondola. * Prices for 29 December - 02 January include New Year dinner. * Maximum occupancy: Double small room - 2 adults; Double room – 2 adults + 1 child or 3 adults; Double large room/1-bedroom apartment - 2 adults + 2 children or 3 adults. * Cancellations can be made, providing details of this are received at least 21 working days prior to check-in day - cancellations made after this period will incur a fee equivalent to the cost of the 3 nights of the accommodation and catering! Cancellations for the period 22 December - 03 Jan can be made min. 28 days before the check in date and cancellations made after this period will incur a fee equivalent to full amount for the accommodation! The location is central, so the hotel offers transportation to gondola lift. 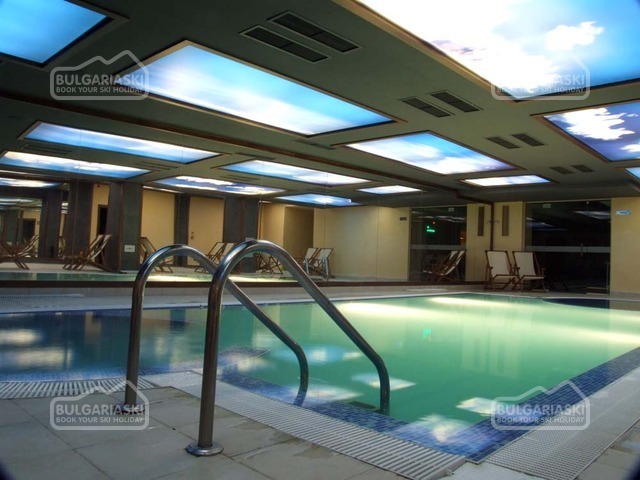 We liked the facilities – sauna, massages, indoor pool and hot tub. 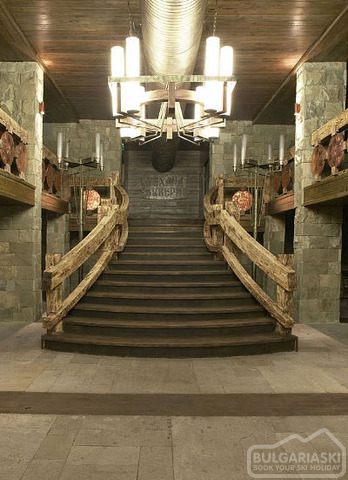 The rooms are nice but there is no balcony in most of them. As a whole good value for money. The reservation process is excellent, your site is very good, but i would like to see reviews from the users on the site, more detailed, evaluating the staff, the hotel, etc, just like on booking.com. Regarding the hotel, the review is not so good. 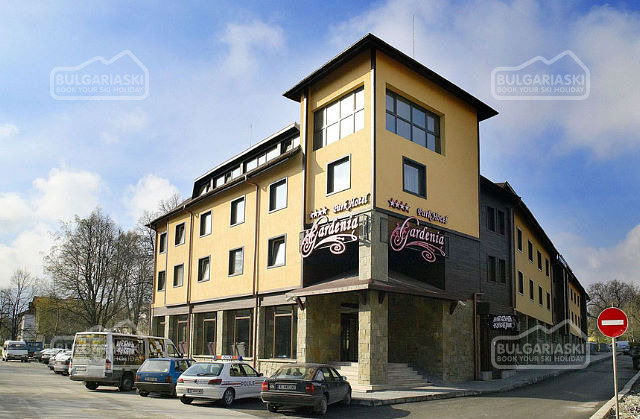 Last year i stayed at Hotel Lion, the reservation was also made on your website, so i have another 4 star hotel in Bansko to compare Gardenia with, and the impression is not good. 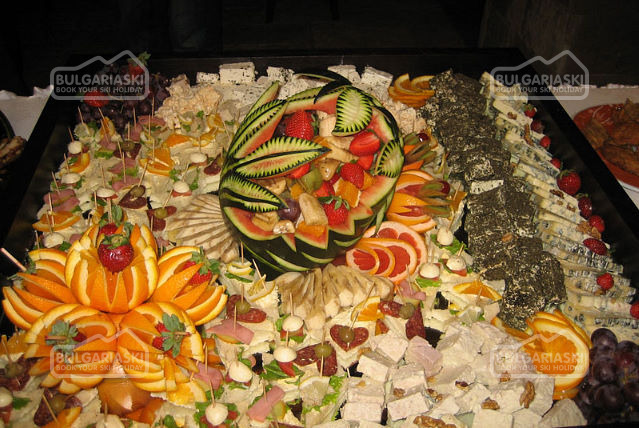 -food not very diverse at dinner: only one soup type and 2 choices for second course. -very poor customer service at dinner: we would ask for 3 beers and a tea and they would come back 5 minutes later only with 2 beers or something like that. And this happened every night. I think they were under-staffed as there were only 3-4 waiters for the entire restaurant. Also they were very slow to clean the tables. -rare shuttles to the gondola: they were every half an hour, but in the morning there were many people trying to get to the slopes, so the bus got extra-full with people standing and very crowded, other waiting outside already, and the driver would not leave, because he respected the half-hour schedule. -the rooms were not clean enough, in the closed there was a lot of dust on the shelves, we had to clean it with a napkin; also i found two pairs of socks in the closed, this shows how much they were paying attention when they cleaned the room. 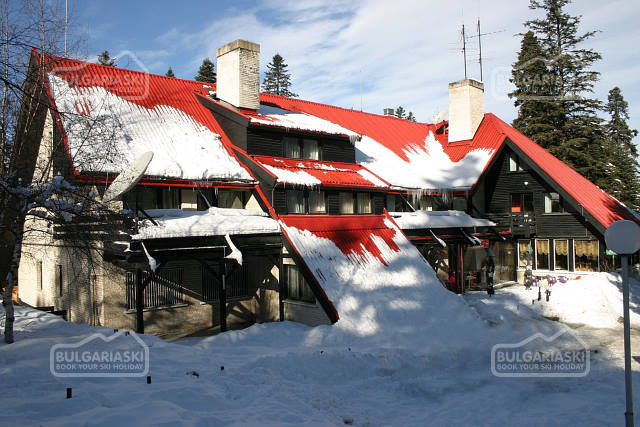 Overall the holiday was fine, we had good time skiing, we are surely going to return to Bansko and use the services of your company, but i don't think we will return to this hotel. We loved the Hotel and had a wonderful holiday. - 3% discount until 30 Nov 2019!